During the blessed month of Ramadan, Muslims all over the world abstain from food, drink, and other physical needs during the daylight hours. As a time to purify the soul, refocus attention on God, and practice self-sacrifice, Ramadan is much more than just not eating and drinking. Muslims are called upon to use this month to re-evaluate their lives in light of Islamic guidance. We are to make peace with those who have wronged us, strengthen ties with family and friends, do away with bad habits -- essentially to clean up our lives, our thoughts, and our feelings. The Arabic word for "fasting" (sawm) literally means "to refrain" - and it means not only refraining from food and drink, but from evil actions, thoughts, and words. At dusk during the Ramadan month, Muslims all over Bo-Kaap are sitting down with their families waiting for the prayer call so that they can break fast at exactly the same time! Tables are set with sweet and savory delicacies prepared by neighbours. The founders of this community were the first to bring Islam to South Africa. The community's culture and traditions have also left an impact that is felt to this day. Adaptations of traditional foods such as bredie, bobotie, sosaties and koesisters are staples in many South African homes. The Muslim community in Cape Town remains large and vibrant. It has expanded greatly beyond those exiles who started the first mosques in South Africa. People in the Cape Malay community generally speak mostly Afrikaans but also English, or local dialects of the two. They no longer speak the Malay languages and other languages which their ancestors used, for fear of being beaten or jailed during the time of slavery, although various Malay words and phrases are still employed in daily usage. 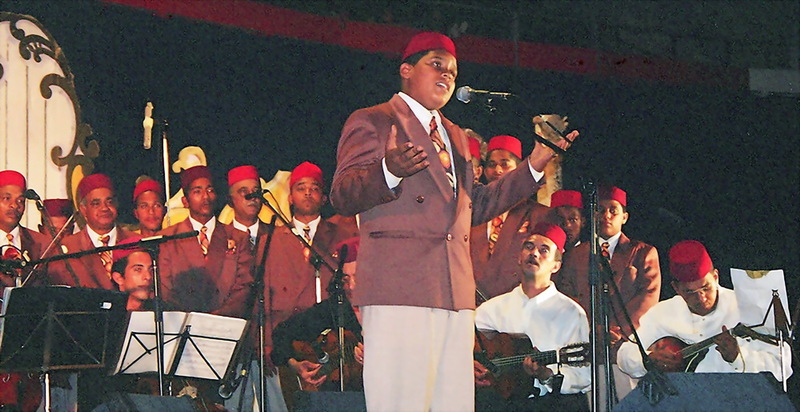 This cultural group developed a characteristic 'Cape Malay' music. An interesting secular folk song type, of Dutch origin, is termed the nederlandslied. The language and musical style of this genre reflects the history of South African slavery; it is often described and perceived as 'sad' and 'emotional' in content and context. The nederlandslied shows the influence of the Arabesque (ornamented) style of singing. This style is unique in South Africa, Africa and probably in the world. 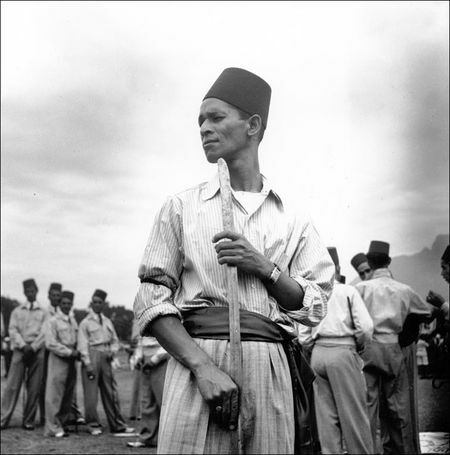 Cape Malay music has been of great interest to academics, historians, musicologists, writers and even politicians. The well-known annual Cape Town Minstrel or Carnival street festival is a deep-rooted Cape Malay cultural event; it incorporates the Cape Malay comic song or moppie (often also referred to as ghoema songs). The barrel-shaped drum, called the 'ghoema', is also closely associated with Cape Malay music. When a Muslim invites guests over for a meal, he almost prepares a feast. Before every meal the Bismillah is recited, which means "In the name of Allah." According to tradition, the host helps himself first, followed by the older male guests. With the exception of soup and certain desserts, all food is eaten with the fingers of the right hand only so that the palm of the hand never gets dirty. Food may not be brought to the mouth in the left hand because the left hand cleans the other body openings. The guests take some of the leftover food home. In contrast to western culture, this is not considered rude. After a community festival, the leftover food is taken to Old Age Homes and Children's Homes or dealt out to the poor. In the most Cape Malay households the main meal is served in the evening when the head of the household is present. Fridays are the exception, for the men attend the Mosque for the compulsory Jumuah prayer meeting. Sunday lunches are also important family gatherings. If friends should arrive during the meal, they are invited to share in the meal. Muslims believe that the food is blessed if anybody outside of the immediate family enjoys a meal with the host. There should always be enough food for unexpected guests and it is very embarrassing when there isn't enough. 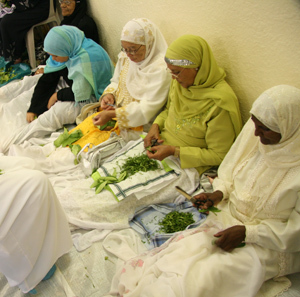 On Mouloodan Nabi in the Bo-Kaap, there is unusual activity in the houses of Cape Malay families as little girls ranging anything from three to twelve years old are dressed up in colourful silken flower dresses handed down by older sisters and cousins. The little girls are then made up. Lipstick is applied and kajhal, the traditional eyeliner worn, ironically, mostly by men in the desert. The reason for this is that the dark coal-like substance absorbs heat and tends to cool the eyelids of the nomads who range the desert. Finally, resplendent in their silk dresses, processions of young girls and women make their way towards the mosque. They have with them boards and knives handed down from generation to generation. These will be used to slice the orange leaves. In the Bo-Kaap this is known as Rampies-sny, literally, to 'cut the mixture'. Soon the air becomes redolent with the smell of orange. The occasion is the Feast of the Orange Leaves, chosen to celebrate the birthday of the Prophet. The sliced leaves are flavoured with expensive oils, mainly rose oil. They are then put into sachets, each one adorned with a red rose and left in the mosque. Then the day pauses and it is silent once again. But at dusk the adult men dressed in special Islamic attire begin to make their way to the mosque. After prayers, salawaat, riwaayaat and talks on the birth of the Prophet of Islam they return home with their gifts and in the dimly lit streets their sonorous voices can be heard calling out, their white flowing robes gleaming in the street lights as they trundle across cobble-stone streets. When the husband arrives home he makes a gift of the rose to his wife and he places the little aromatic sachet in his wardrobe. This will smell of citrus fruit for the next year, perfuming his clothes until the next Feast of the Orange Leaves.